No Credit Checks, Warranties on All Vehicles! The price was exactly in the range I was looking to spend. The quality of the vehicle is exceptional especially for the price range I was looking to stay in. Great customer service with the patience to keep looking for a great car in my price range! We wanted to thank you for the wonderful buying experience we had. We love our Cherokee and we felt great about the pricing. You are fair and honest and those qualities are rare in the automotive selling world. We'll be sure to send our friends your way! Nick and Kelly, you two made it possible for me to get an excellent car at a fantastic price! 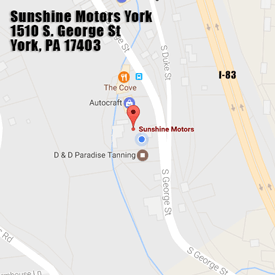 We purchased a used car from Sunshine Motors in York PA. The whole process was easy from start to finish and we love our car! Good credit - bad credit, you won't be turned away! Expertly Re-Conditioned Vehicles - Low Payments - Trade-ins Accepted -Warranty Included. NO Hassles, NO Credit Checks - We don't look at your past, only your future!